Black Zara Boots first surfaced on Chictopia's streetstyle gallery in Fall 2008 seen on Washington blogger districtofchic of districtofchic.com. She wore her black Zara booties boots with a gray Rapt in Maille chainmaille necklace, white Gap leather jacket, and blue Richard Chai for Target satin dress. Since then, Black Zara Boots have grown in popularity as bloggers from Budapest, London, and Manila have discovered them. Black Zara Boots are generally seen in casual, chic, and urban style. Popular types of Black Zara Boots are patent leather, ankle, biker boots, studded, and ankle boots. 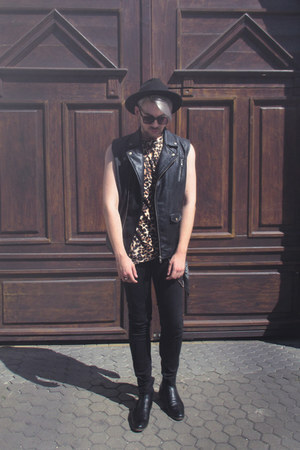 There are currently 2312 streetstyle photos of bloggers wearing Black Zara Boots. Most recently, blogger Danielle_M of tendinteinmoda.com rocked her black Zara boots with a navy asos dress.